Shadjam – Nabhi/Abdomen, Rishabam-Hridaya/Heart, Gāndharam -Kantam/Neck, Madhyama-inner tongue, Panchama-Nose, Dhaivatam-Teeth and Nishādam-Lips are the position of swaras. It should be understood that these are not the only positions from which the swara sounds. 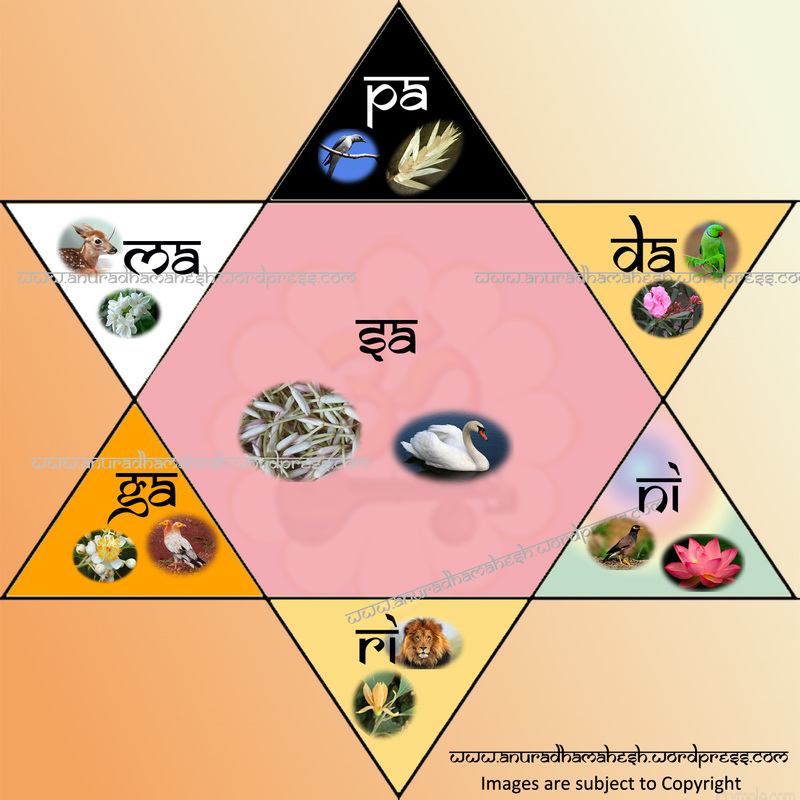 For instance, the name Shadjam indicates that it emanates from six positions or sthānas. Swan, Lion, Bherundam, Deer, White cuckoo, Parrot, Mynah are the birds respectively. Why these names for Saptaswaras ? Shadjam – Since the Swara is sounded from 6 positions such as nose, neck, heart, inner tongue, teeth and lips, the swara is named as Shadjam. Since this swara is also the cause of producing other six swaras R G M P D N, it is named so. Mythologically , Shadjam swara resembles the cry of a Peacock. This swara devathā was first seen by Agni. Rishabham – The air/vāyu that rises up from the Nabhi, touches the neck and the head and produces the sound that resembles that of a bull’s bellowing. Hence the swara is named as Rishabham (the Sanskrit name for bull- Lord Siva’s vehicle). This note captivates the heart of the listener and is said to originate from the heart. This swara devathā was first seen by Brahma. Gāndharam – The air/vāyu that rises up from the abdomen/ Nābhi, touches Hridayam and Kantam, three strategic positions, and hence the name Gāndharam. This swara is the important note for Gāndharva Vidya and represents the word in the form of Gāna or Sangeetham, and hence termed as Gāndharam. Mythologically the swara resembles the bleating of goat. This swara devathā was first seen by Chandra/Moon. Madhyamam – The air/vāyu that rises up from the abdomen/ Nābhi touches the heart and shines in the middle portion. The swara is centrally located between the other swaras G R S on the lower frequency and P D N on the higher frequency (SRG-M-PDN). Hence, aptly named as Madhyama swara. The swara resembles the Call of Heron. This swara devathā was first seen by Vishnu. Panchamam – The air/vāyu that rises up from the abdomen/ Nābhi touches Hridayam, Kantam, Sirassu (head) and Oshtam (lips). Since the swara touches the five strategic positions including the Nabhi, the swara is named as Panchamam. The swara resembles the Call of Cuckoo. This swara devathā was first seen by Nārada. Dhaivatham – The air/vāyu that rises up from the Nabhi touches Hridayam, Kantam, Sirassu (head), Tālu (inner tongue) and Dantha (teeth). Since the swara touches the six strategic positions including the Nabhi, the swara is named as Dhaivatam. The name also means worshipable. The swara resembles the neighing of the horse. This swara devathā was first seen by Thumburu. The readers may wonder, these swaras are just a form of sound or nāda and how flowers, ornaments, janma naksthra, weekday etc are assigned to them. Modern researchers may criticize this concept. It shows the mindset that if we do not understand a concept, that concept is wrong. Experts who have learned this Sāstra in accordance with lakshya and lakshana, from the Great Gurus who were nadōpāsakas, according to strict upāsana krama and bhakthi, will definitely be able to understand the divine subtlety. Subtlety cannot be seen, it should be felt within oneself. These Sapta Swara devathās have Dhyāna Slōkas, Beejāksharās or Mantra syllables, Yantrās, Chakrās and other relevant details to prove that they are like any other GOD / GODDESS seen as per Hindu Mythology. When these swara devathās are worshipped through shōdasha upachārās, their spiritual presence is felt by the Upāsaka. When such an Upāsaka sings Raga Deepakam, lamps will be self-illumined (Great Musician Tānsen), when such an Upāsaka sings Amrithavarshini (Muthuswami Dikshitar) or Megh Malhar (Tānsen’s daughter), it brings torrential rains and Malayamārutham brings gentle cool breeze, to quote a few examples. The universe is under the power of GOD; the GOD is under the power of Mantras; the Mantras are under the power of the noble souls and therefore such souls are Godly. When the mantras itself takes the form of Swara Devathās which in turn becomes Sangeetham, it bestows Eternal Supreme Bliss – Bhukthi and Mukthi. May the Swara Devathās bless us to attain Divinity and the Knowledge of the Self through Bhakthi (devotion) and Sādhana (practice). This post is dedicated to all great Nadopāsakās the world has ever seen! !